Congestion pricing will save money and it will save lives — but it will also save New Yorkers hundreds of hours of stressful commuting. A new analysis by TransitCenter revealed just how much time: 110 hours per year in unnecessary delays for a typical commute from Jackson Heights to the West Village on the E train, 43 hours per year for a commute from the South Bronx to Canal Street on the 6 train, and 36 hours for a C train commute from East New York to Downtown Brooklyn. The pro-transit group, which supports congestion pricing as a crucial revenue stream for the cash-strapped MTA, hopes the numbers will pressure outer-borough lawmakers who are reluctant to support tolling drivers even though doing so would benefit the vast majority of their constituents who use transit every day (fact sheet below). 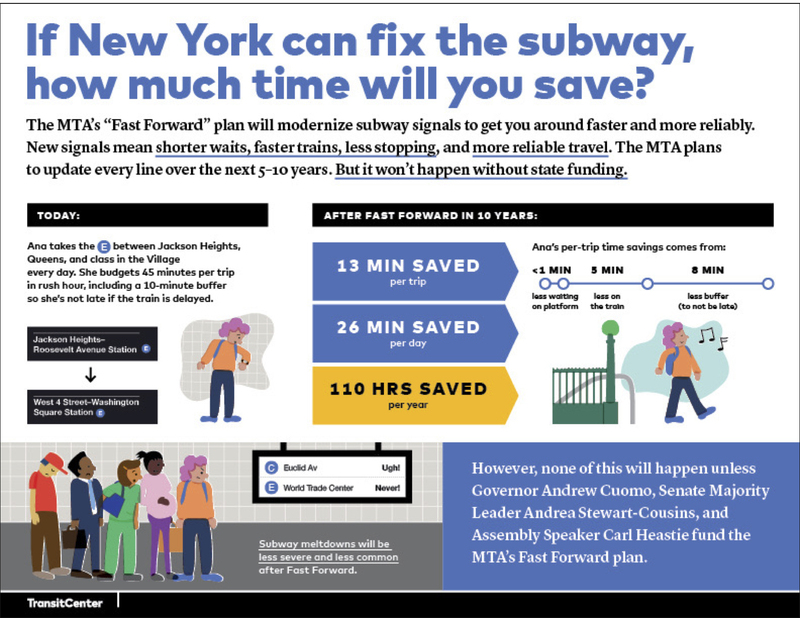 The analysis was based on existing wait times on platforms, delays, excess “buffer time” that commuters build into their rides and previously unreleased train arrival data from the MTA. But very little of the so-called “Fast Forward” plan can be achieved without the $15 billion in bonding power created by congestion pricing. In its most eye-popping statistics, TransitCenter singled out several opponents of the tolling scheme to demonstrate how horrible their constituents’ lives are right now. Queens State Senator Leroy Comrie’s 25,000 subway-riding constituents, for example, would collectively save 838,000 hours per year. Neighboring Senator Joe Addabbo’s subway riders would collectively save more than 1 million hours per year. Yet both oppose congestion pricing, even though a tiny fraction of residents of their district regularly commute by car into the congestion zone. That opposition appalls supporters of the tolling scheme because it suggests that Comrie, Addabbo and other opponents are simply bad Democrats. Many have been. But the message is not being received. Senator Roxanne Persaud of Queens said that she “has some concerns” about tolling Manhattan-bound drivers because her district is a “transportation desert,” said her spokesman Matthew D’Onofrio. What is best for her constituents is transit. According to data compiled by the Tri-State Transportation Campaign, three percent of Persaud’s commuters regularly drive into the central business district of Manhattan, while the majority take transit to work. And in Persaud’s disadvantaged district, the median income of drivers is more than $13,000 per year higher than that of transit riders. Meanwhile, a new analysis by CHEKPEDS, the Chelsea-based pedestrian group, showed that Persaud’s driving constituents would save 70 minutes per week, or 58 hours per year. That data was built on research from transportation analyst Charles Komanoff. The group’s analysis also showed that congestion pricing would save 71 lives currently lost to road crashes and result in 17,000 fewer injuries in its first two years. “Achieving such significant reduction in crashes without having to wait years and spend millions of taxpayers’ dollars is an opportunity we cannot miss,” said Christine Berthet, CHEKPEDS co-founder. Congestion Pricing will Eventually Save Transit Riders up to over 100 Hours Per Year! from STREETFILMS on Vimeo. My commute to work is 9+ miles one way. Every week, I save 5 hours or more by using my motorcycle instead of the subway. That’s about 260 hours in a year, minimum. That’s nearly half the time it takes to get to work on the subway. For the subways to reach that level of efficiency will take years. That’s why incentivizing motorcycles and powered two-wheeled vehicles by exempting them from the congestion toll is a sensible solution, especially if you really care about commuters having more time, now, in the present, sooner than later. Most, probably all, European cities already know this and hence, exempt motorcycles from congestion tolls. Motorcycles, scooters, ebikes- all are part of the solution. How much does it cost you to park a motorcycle? Given that the target of the toll is congestion, vehicle size should absolutely play a role in how much is paid. In addition to motorcycles and other small two-wheel vehicles being mostly or fully exempt, massive trucks and SUVs should pay more. How does it cost you $0? Street parking. Easy to find parking as a motorcycle takes 1/6th the space of a car and nearly the same as a bicycle. It can be better but it still works.